1985 was a great year, not only because Michael Jordan was rookie of the year and played in the All-Star game, but because the Air Jordan 1‘s were released. The Air Jordan I was the first shoe to be worn in the NBA with multiple colors. Peter Moore was the man behind the Air Jordan 1 (and also helped design the Air Jordan II). When Michael Jordan first looked at the AJ I, his response was “I’m not wearing that shoe. I’ll look like a clown”. With time, the shoe slowly grew on him. The original Air Jordan 1 retailed at $65.00. 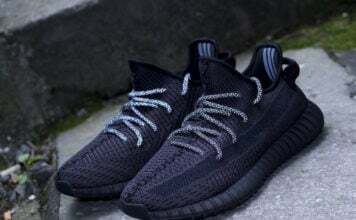 Soon after the release of the Air Jordan I, David Stern (Commissioner of the NBA), banned the most popular shoe of the decade to be worn by MJ. 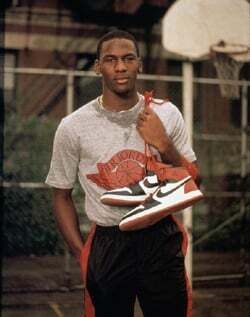 Every time Michael stepped on the court with a pair he would have to pay a couple thousand dollars. 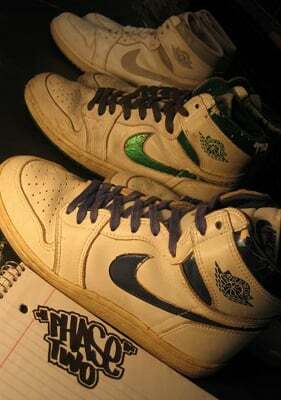 Nike loved this idea so much that they encouraged MJ to wear the shoes, and Nike would pay the fees. In result, Nike gave the the Air Jordan 1 “The shoe banned by the NBA” label. There was 23 different color variations released, and this is not including the three colorways of the Air Jordan I KO. Each AJ I shoe came with two sets of laces which matched the color combo. In 1994 Nike re-released the Air Jordan 1, which retailed for $80.00, but they sold terribly, hitting sales racks for $20.00. In 2001-2003 the Air Jordan Retro I once again was re-released, and in 2004 the Air Jordan 1 low made another appearance.